Thanks for sharing these photos, Mark! 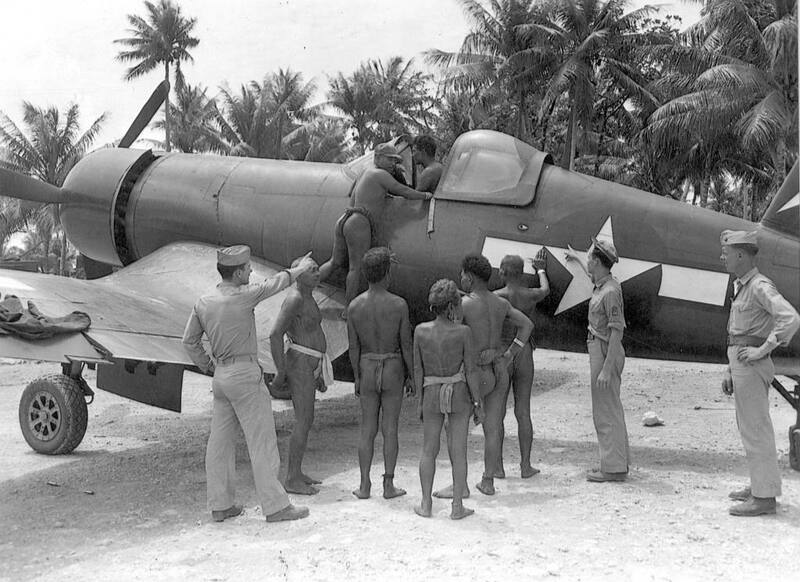 In the Corsair photo, it is pretty easy to identify the guy standing at the far right. I was pointed to this site two days ago and have joined. In 2001, I found the USS Mississinewa in Ulithi Lagoon. We searched for months trying to find the mooring chart, and were only successful three years after the discovery. Would love to know when the copy on the site was posted. Anyway, have some of Sid Harris' remarkable shots of the ship sinking, as well as what it looks like now from my article published in Wreck Diver Magazine. Need some help on how to get them on the site, if interested. Also, planning an expedition (June, 2015) to Tuvalu (Nukufetau) to find three SBD-5's that splashed when the tanks ran dry. Good friend rescued some of the crew members (all survived) but trying to get more information on these, others (B-24 and F4F also supposed to be there) and life on the atoll, if any is available. Thanks for any help and hopefully, this post works. All advice is welcome!! Anything you would like to have posted feel free to ask for assistance, many here including myself would be happy to help and I for one would love to see what you have. attached are several film clips of the USS Mississinewa at Ulithi. I have many shots of the Mississinewa sinking, our photos of it when we found it and when it started to leak and the Navy brought me back to help stop the oil leak. I've tried to paste them in this dialogue box, unsuccessfully. I could email the article and some of the photos and you could try or...? Of course Chip I would be happy to post them for you. (Or if you like you can create a photobucket account and post away) If you'd like to list your email address and I'll contact you. Even though this site is predominately all things warbird, your photos will still be quite welcome and appreciated I would think. I believe this is a VBF-85 Corsair, judging from that tiny little piece of insignia showing on the vertical tail. I was fortunate to serve aboard Randolph in V-6 Division as an AT2 from Feb 1960 to May of 1962. We still had a piece of that Japanese Kamakaze on our quarterdeck so hearing your dad's story brought back some great memories of my time aboard her. Recovery of John Glenn & Gus Grissom, collision with a Liberian tanker while I was serving on the Master at Arms, liberty over the 4th of July in Quebec City, trips to Manhattan, cruising the Carribean including multiple stops in Gitmo, San Juan, St. Thomas. Flying off her & traps as a crewman on the COD. It was a different time & our Navy is still the best in the world. Thanks for posting and many thanks for your service. Certainly was a different time wasn't it. Mark send me a PM. I'm making a film and have a question about a picture and if it is ok to use a couple. Greetings, I won't be able to send you a PM just yet as I believe your too new a member. But please feel free to use what you like. Their public domain and for anyone to use as they wish ... as long as their used with care and respect is all I ask. Also please feel free to share details on your film if you like. I'm sure many here would be interested. what was the purpose of having 3 japanese soldiers their & how did they get their? ?